Born in 1977, Vincent Abadie Hafez is a French artist who lives and works in Toulouse (France). Under the pseudonym of Zepha, he took part in the graffiti movement as of 1989. Trained in graphic arts, he enriched his art by concentrating on learning traditional calligraphic techniques, concentrating particularly on plastic interactions between Oriental and Western styles. Influenced by the work of Hassan Massoudy and Georges Mathieu, he has developed a singular visual language through his research on the deconstruction of the letter and the cross-cultural meanings of the signs. 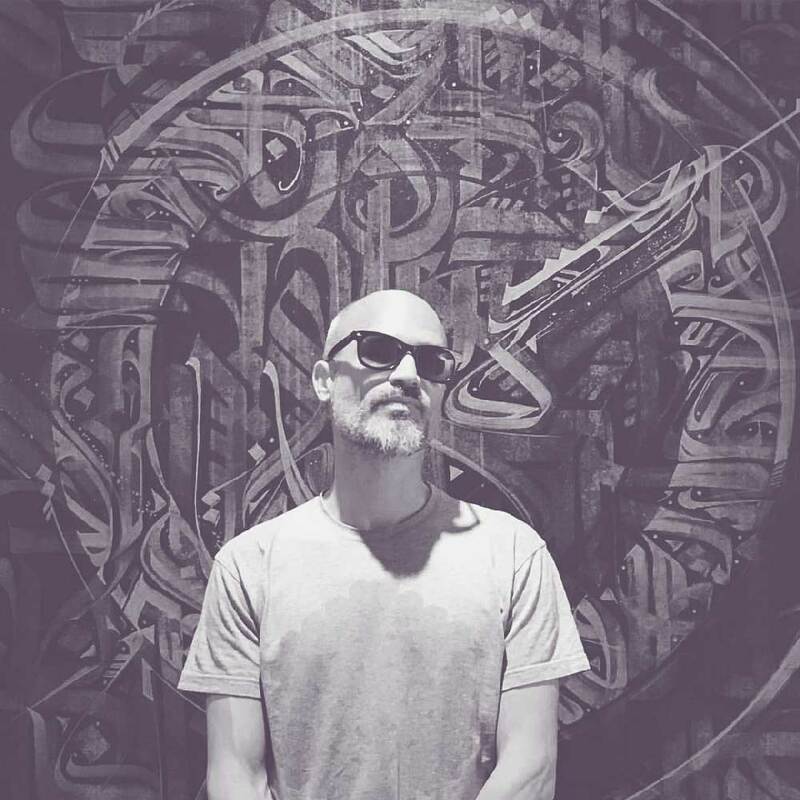 Recognised as one of the founders of urban calligraphy, he participates in the diffusion of a new aesthetic, breaking away from pictorial forms hitherto explored in the vandal writing styles. 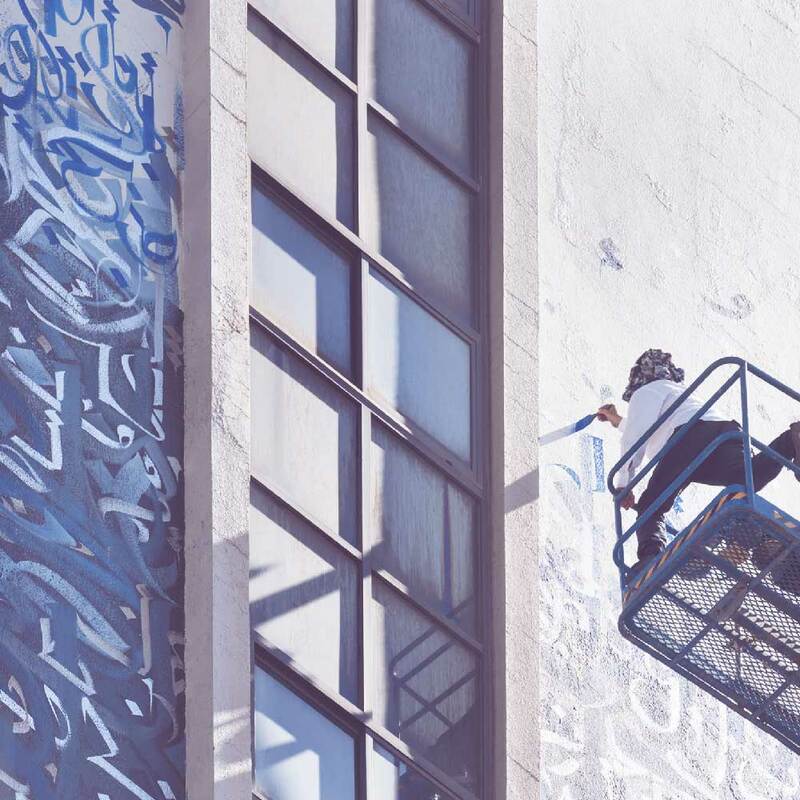 His abstract, methodical and condensed compositions take form in public spaces through monumental mural works in Europe and the Middle East. The gestural expression and the notion of movement are two fundamental components of the creative process that he pursues simultaneously in his studio work. Linking the formal to the spiritual, his work deconstructs the referents and reads as an enlightening source, praising a neglected universalist thought. 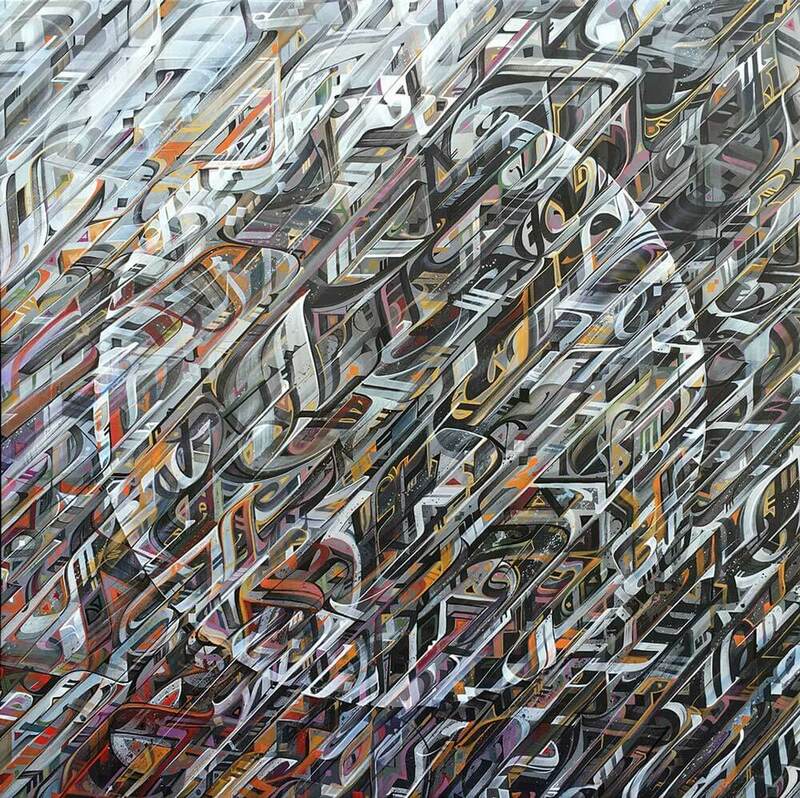 Contemplating Zepha’s work, our eyes wander through its labyrinths. 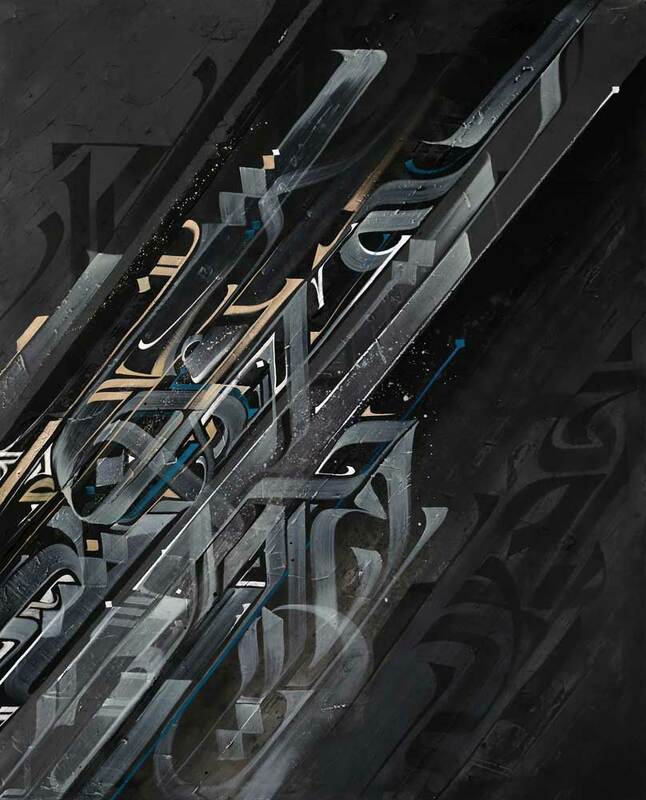 We seek a reading, a meaning, and end up diving into the maze of this universal calligraphy. Symphony of letters and colorful signs, dynamic and expressive gestures punctuated by a harmony of colors: Kufic or Uncial, Orient or Occident, invented alphabet, imaginary calligraphy. Entire wall or human size canvas, large or small work, brings out the same creative energy. From the metal or wood of his bas-reliefs to precise cuttings emanates a similar force, such as a flight of arrows thrown in order to overcome gravity. Hundreds of gestures ruled by an inner order, a breath. Zepha gives cohesion to all these dynamic or static movements. Facing a wall from a distance or a painting from a closer angle, we derive the mere pleasure, pleasure to see these peaceful swirls. Curved lines alongside straight lines, diagonals, forest of writings sometimes quiet, sometimes fiery, golden or silver on a matte black background, blue or gray on a shiny background. The large circles of writing whirl, reminding us of the wheel of the norias on the Euphrates or the Orontes which turns and turns tirelessly and quivers the water vibrant of shades and lights. These wide circles composed of large signs seem to be orbits, surrounded by a procession of small letters in perpetual revolution in cosmic time. With a set of transparencies and overlays, Zepha creates depth. Letters sink, move away or float, as if hanging. Others appear closer. Without any clash, static gestures offer dynamic gestures the freedom to move and fly away. The thick or fluid colors allow the brush to show stability or movement. This is how the right gesture becomes a mere gesture. Shadow and light. A movement owes its clarity to golden or silver colors, the light brightens the dark, the colorful material gives life to quick gestures. From the bottom to the top floor of a building, on his elevator, under the scorching heat of the sun, in the wind, rain or cold, brush in his hand, Zepha gently attacks the wall. The first signs become references and give the rhythm to everything that follows. Here and there hidden lines give structure the internal space of the composition. The morphology of every gesture contributes to the creation of traces animating the entire surface of the work. An unjustified emptiness, a space missing of accuracy are pretext to be filled by a sign or a red dot, and here is the balance restored. Despite the great freedom of realization, the work is mastered and leaves little room to randomness. Zepha manages the imbalances created by the multitude of letters that snake and wind. Rigor and freedom complement one another. Each creation is endowed with its own originality, here a rough wall, there a smooth wall. Everything participates in the technique of the work and provides the desired freedom. It is necessary to apply energy to each area, from the small gestures to the larger ones and to adapt and fit to every rebel situation. Softly touching the surface or increasing the pressure on the brush creates a different material. A tone or half a tone of color can shed more or less light through the gestures. Light makes it possible to see the nakedness of the sign drawn: no correction or alteration, no filling in, no hesitation. The imagined work is achieved. Being able to be quick to master rightfully the slowness and conversely, be very slow to accomplish the fast attack. Like an arrow drawn, each letter must reach its goal, settle in its place calmly or quickly. The gestures can be cold slow or hot fast. Zepha is able to stop his movement when the sign has arrived to its exact place.